The arm of Sarah Nelmes, a dairy maid, who had contracted cowpox. Jenner used material from her arm to vaccinate an eight year old boy, James Phipps. 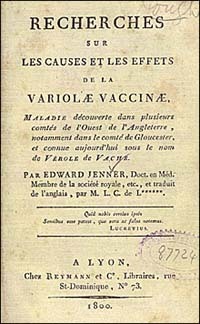 Edward Jenner, An inquiry into the causes and effects of the variolae vaccinae, a disease discovered in some of the western counties of England, particularly Gloucestershire, and known by the name of the cow pox (1798). 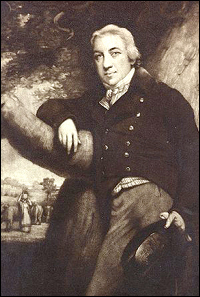 Edward Jenner, an English physician, used folk knowledge to find an alternative to variolation. Recognizing that dairymaids infected with cowpox were immune to small-pox, Jenner deliberately infected James Phipps, an eight year old boy, with cowpox in 1796. He then exposed Phipps to smallpox–which Phipps failed to contract. 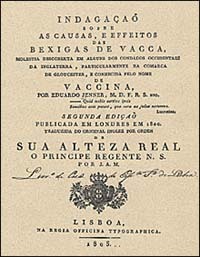 After repeating the experiment on other children, including his own son, Jenner concluded that vaccination provided immunity to smallpox without the risks of variolation. Jenner’s findings were published in 1798. Vaccination was not without its critics. 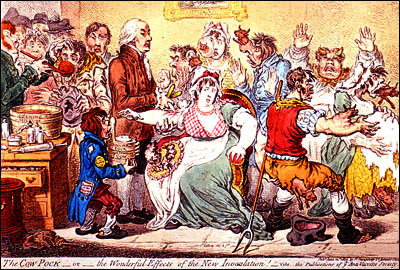 In this cartoon from 1802, the British satirist James Gillray implied that vaccination caused people to become part cow. Vaccination provided immunity for up to ten years. Because war always spread smallpox, governments encouraged recruits to be vaccinated. In 1807, the Bavarians became the first to require recruits to be vaccinated and the practice of vaccination spread with the practice of war. Although he was a country physician, Edward Jenner had studied with and maintained contact with the leading physicians of his day. 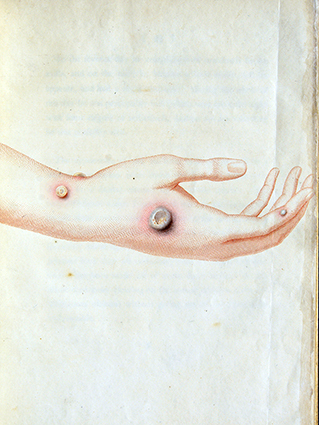 His cowpox experiment was performed at the urging of John Hunter, a prominent London anatomist and Jenner’s former teacher. 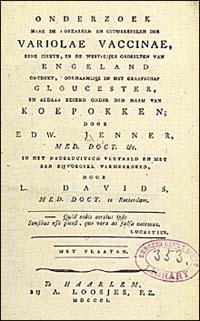 Within twenty years of its publication, Jenner’s text had been translated into a variety of languages including Portugese, French, Dutch, Italian and Japanese.